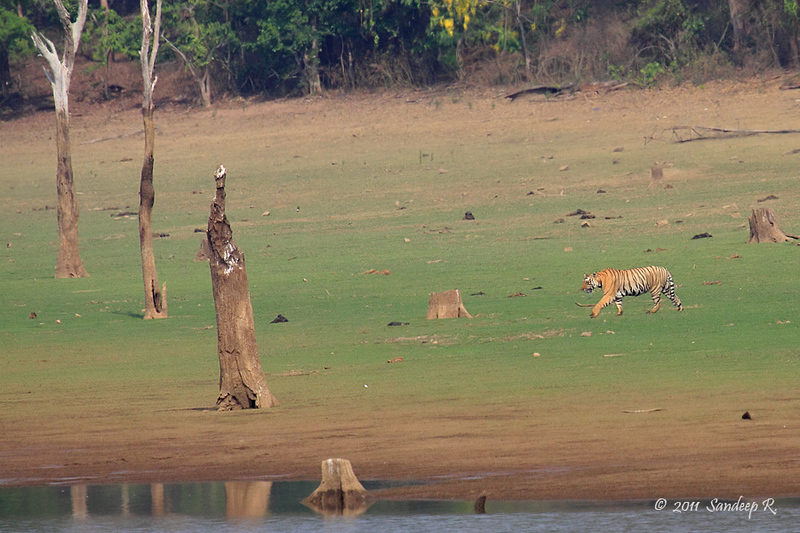 All my trips to Kabini have been very short, lasting not more than 2 days. But I am glad to have visited this magical place once every year in the last 3 years. Each visit has been a different experience, appreciating different things. 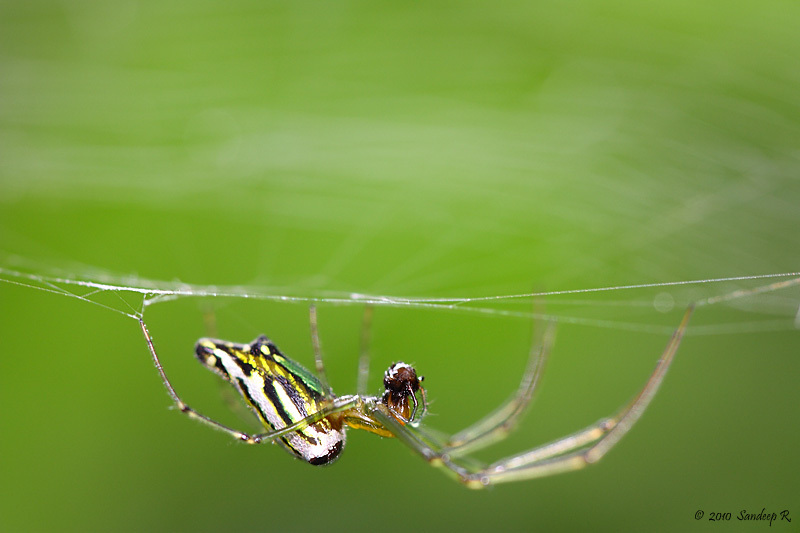 First time it was the awe of mammals, second time it was the admiration of winged beauties on the back waters, and this time it was about life on the forest floor, of arachnids and insects. Despite driving for about 12 hours the previous day, I got up by 5am and headed to Shreeram’s house, and from there we picked Adarsh, Deepa and Tarangini. Stopping over at a few places for birding, we reached Kabini by 1pm. 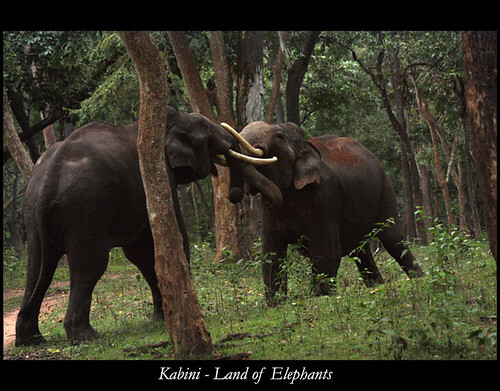 Usually the first thing that comes to mind when you say ‘Kabini’ is Elephants, perhaps Leopards. Not the variety of spiders! This trip was special not because I got to see a leopard, but because I witnessed a sequence of events that one sees only in a wildlife documentary – A Spider Wasp hunting a Tarantula, dig a hole (to lay an egg) and drag the paralyzed tarantula into the hole, and then close the hole. All these action was right outside our tent at JLR camp! The first day’s evening safari was a expected drive in the park – Chitals, few common birds, and surprisingly no elephants. Shivanand, JLR naturalist, told me that the relaid road of Mysore-Mananthwadi highway has made the sighting of big cats on the highway less common than it used to be, thanks to the frequent buses and lorries. No wonder we didn’t see many mammals last time i drove expectantly on this patch on way to Wayanad! Also, I felt the detour to reach the national park limits from JLR camp was longer than the route through Karapura village. The next day, we saw a crested hawk eagle first up in the morning safari. The light was dull. A few photographs later, we got into the forest tracks. Soon, we got a call about leopard sighting. Reached the spot in a whizz. The leopard seemed to have had a good meal, and was in a mood for a nap. Dinesh Kumble had the first sighting and had informed us. Another jeep reached the spot at the same time as we did. We got a few record shots. 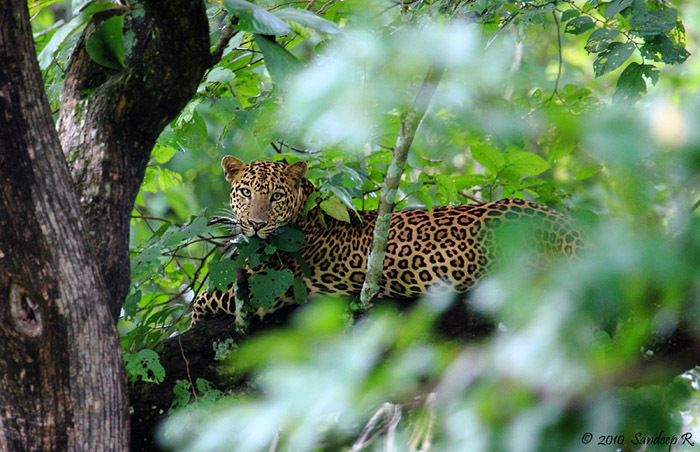 Though he was very close, the leopard was nestled in the foliage and we didn’t have good angle for photographs. I suggested to move the jeep ahead. For I felt we can get a better angle and view if the leopard decides to descend. There were already 4-5 jeeps, and I was pretty sure the disturbance would get the leopard to get down the tree. But my request wasn’t heeded. The jeep was put a little ahead and stopped. We did get a few ‘better’ shots when the leopard looked towards us. But soon after, he decided to end the show. Got down and disappeared into the bushes. We later realized what an awesome view it would have been had the jeep been moved to the spot I suggested. I was mighty disappointed and slightly mad at JLR naturalist, not just for not moving the jeep to the spot I suggested, but also for not taking us back to the spot where leopard was sighted, to the end of the safari an hour and half later. But anyway, there’s only so much we had to sight i guess! Back at the camp, we were to take a walk around the camp to see some life in the undergrowth. But Shreeram saw a Wasp that had brought down a tarantula right outside our tent. Soon, the wasp started digging a pit. We were excited to see what was going to unfold. We took turns to have breakfast, so that one can stay back to watch the wasp and inform us if something happened. We did not want to miss the action of Wasp dragging the tarantula into the pit. Spider wasp lays a single egg on the abdomen of the spider. 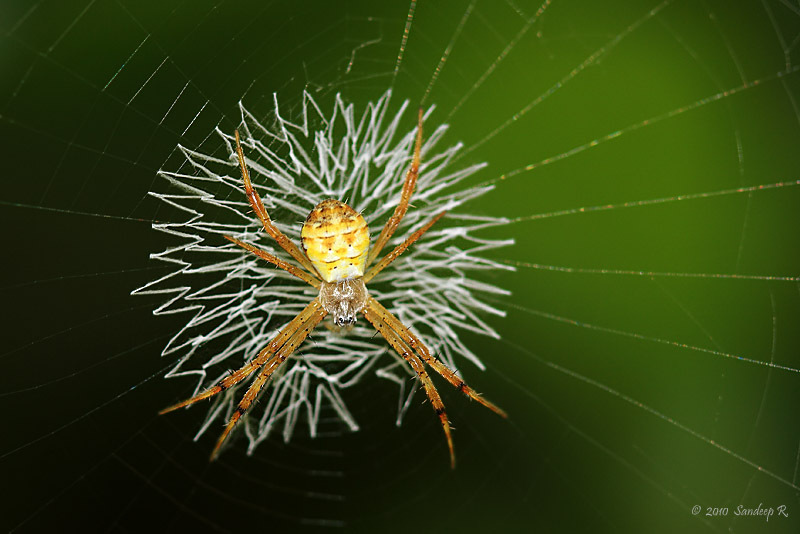 Once the egg hatches, the larve feeds on the live spider. 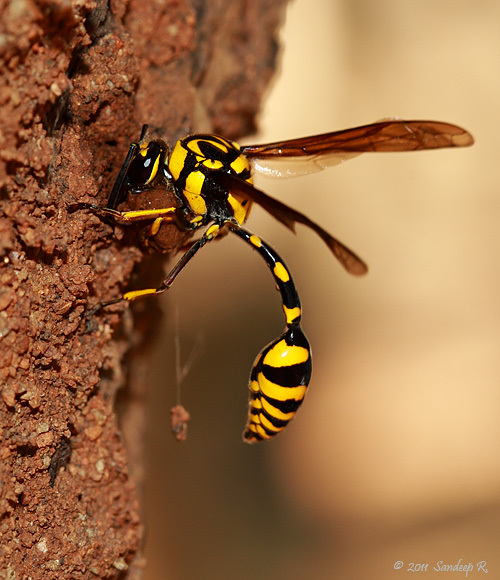 The size of the food (spider) determines whether the young wasp would be a male or female. More food means wasp can grow bigger and hence female. Female wasps don’t care about size zero you see. We didn’t know that this would take more than 3 hours! But here you have it compressed in a little over 4 minutes. I so wished I had a video capable DSLR and a macro lens. The footage would have been much much better. This is all I could manage with Panasonic Lumix FZ8, which still has done a great job. 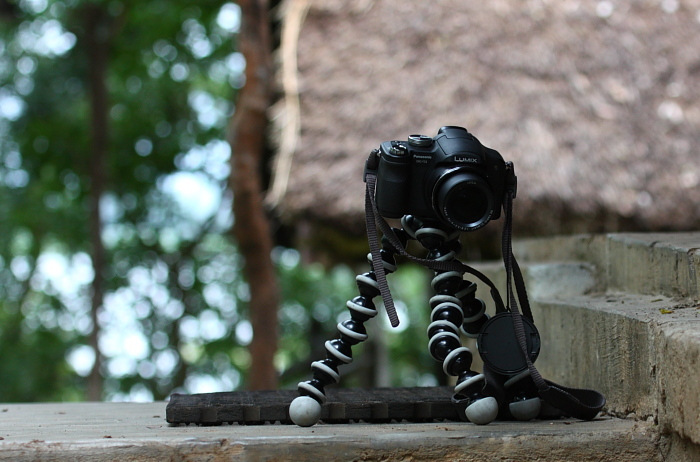 Gorillapod was very handy as well. Click here to see the setup. 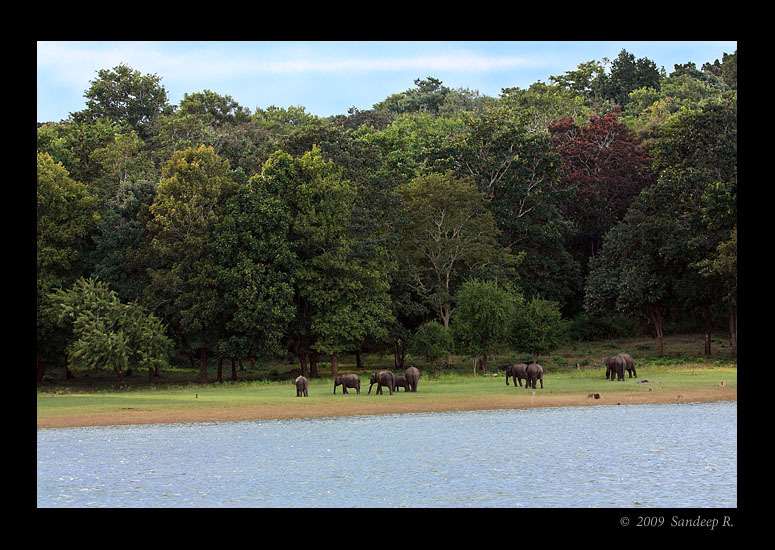 The landscape of Kabini is mesmerizing. It has everything a wildlife enthusiast can wish for. I made a short trip on weekend, dull and cloudy weather played spoil sport, but I was proved right in my decision of buying Canon 100-400mm IS USM, and not any other lens that i considered. I will write a detailed review of my reasons to buy 100-400 after few more trips in good lighting conditions. I just took one boat safari and was a great one in the of birds sighted. 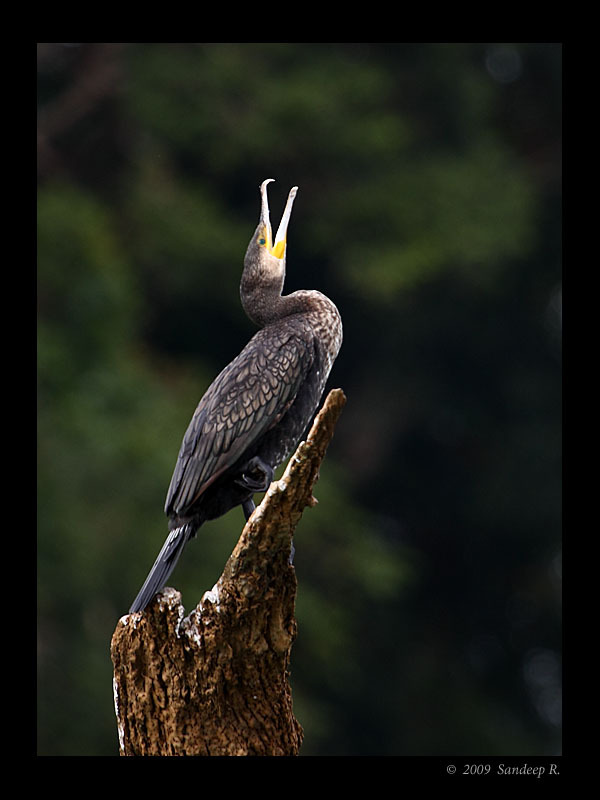 Right at the start were Indian Cormorant, Little Cormorant, Great Cormorant and Darter. The little one gave an unusual pose. A scan of the banks of the lake on binoculars showed the a herd of mammoths. 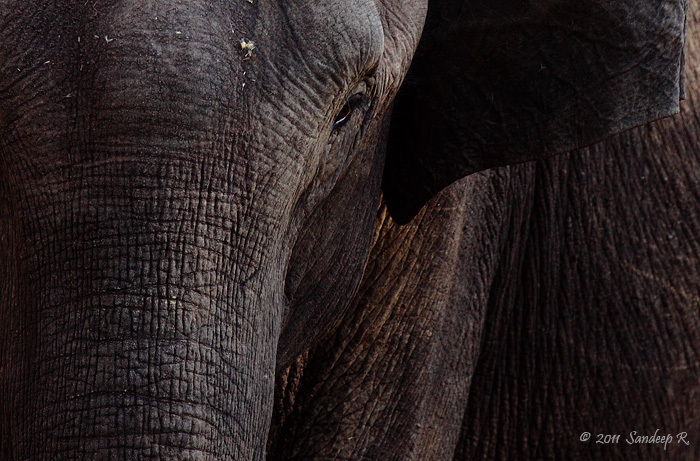 Sambhars, Langurs, Chitals, and Wild boars were seen as the boat navigated towards the elephants. 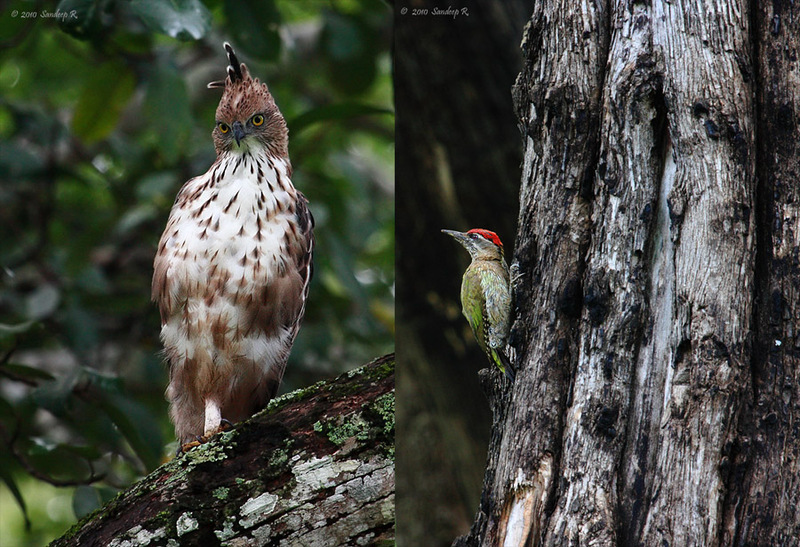 Winter visitors – Large Wood-shrike, and Osprey were lifers for me. Pacific swallows, Wire-tailed swallos, white breasted kingfishers, a stork-billed kingfisher, pied kingfisher, Woolly necked stork, painted stork, Asian open bill, and Egrets were all a treat to watch. 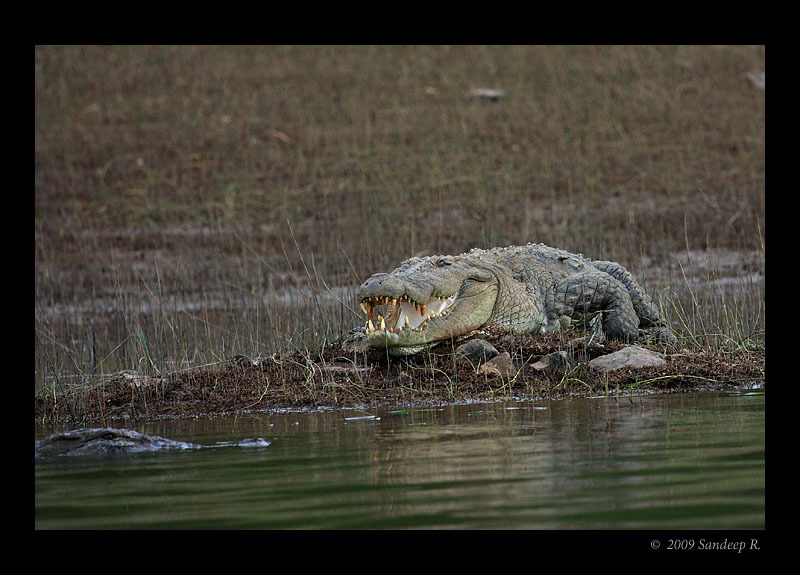 A huge mugger crocodile was basking on the banks, while another one was lurking in the water. A small bunch of Malabar Pied Hornbills were the last of the species sighted. I drove on the stretch from Karapura village to Manandvadi on my car. Many leopard/tiger sightings happen on this stretch, but i wasn’t lucky this time. 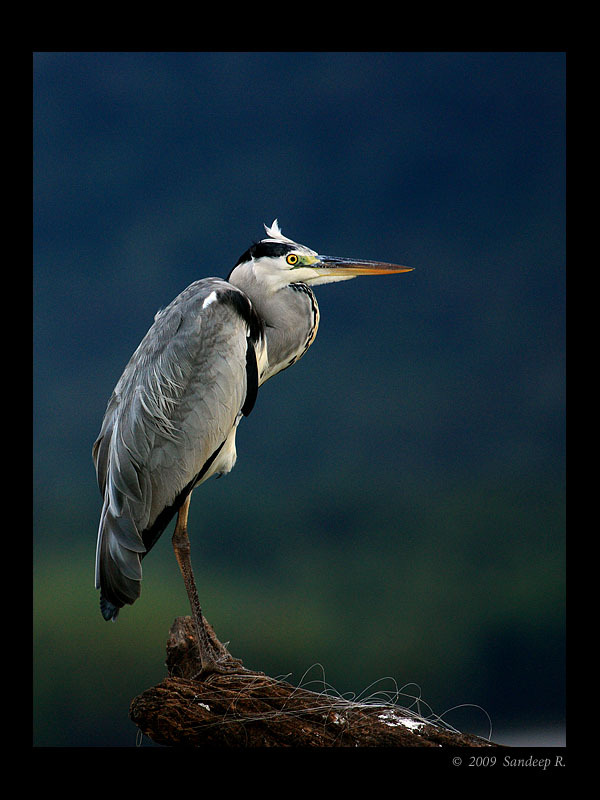 This image Grey Heron, roosting on a dead tree, was my frvourite from the trip. We reached JLR by 12:30pm. At the reception we were briefed about our activities for the next 23 hours. A board displaying the recent sightings had Tigers, Leopards, Sloth Bear, Python, and Wild dogs. 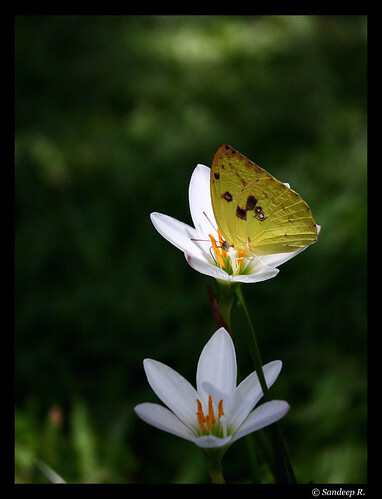 This apart from the common ly sighted spotted deers (chitals), sambhars, elephants, and numerous birds. Sightings in the morning were more than that in the evenings. Checked into our rooms soon, freshened up and had lunch by 1:30pm. Lazed around for sometime after lunch, picked up our gears from the room, had tea and left for safari by 4:00pm. Prem was our driver and naturalist. First up we spotted a tusker on the Mysore – Mananthavadi highway. This stretch is intentionally under prepared to avoid roadkills. We drove into the jungles with the hope of spotting a big cat. Nearly an hour in the jungle and no luck. Few spotted deers, racket tailed drongo, white throated kighfisher, a glimpse of sambhar and that’s about it. A radio message informed Prem that there was a tusker fight at some part, and he started driving to that spot. 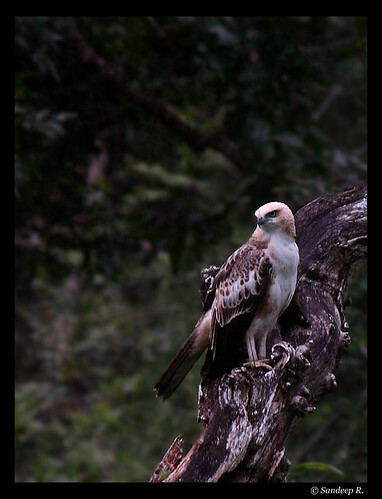 On the way we sighted a Crested Hawk Eagle (EKA Changeable Hawk Eagle) perched nicely on a dead tree, fired a few frames. Soon, we spotted couple of Malabar Gaint Squirrels but were hard to capture. The light was already fading, lower shutter speed and high ISO didn’t get the best of the images. When we reached the spot we saw 3 young tuskers, two of them were tussling with each other. The third one walked into the bushes. The other jeeps had left the spot, and Prem maneuvered the jeep around so that we could get a best capture of the tussle, but the elephants always positioned in such a way that we couldn’t get a perfect shot. Nevertheless, Prem did as much as he can and we got a few decent snaps. The first image in this post, at the top, was this fight. It was almost 6pm, and we were to leave that area. Spotted few Sambhars but were almost impossible to photograph even at 1600 ISO. Back at the resort, watched a documentary on the wildlife at Kabini. We were convinced that summer was the best time to witness the best of wildlife and largest congregation of Asian elephants in the world. Prem also suggested us to visit at least for two days during summer to capture best of the wildlife at Nagarhole national park and Kabini backwaters. A sumptuous dinner, and bonfire for some time. Slept by 11:30 pm. Next morning, got up by 4:45am. The wakeup call was at 6am and the safari at 6:30am. We wanted to capture few long exposure landscape shots on the backwaters, so got up early, got ready and left for shooting by 5:45am. Then Safari, again with Prem, by 6:40am. Prem was about to take us along one direction of Mysore – Mananthavadi highway, we saw two jeeps heading in the opposite direction. He turned on the radio, and we were informed about a leopard sighting. He rushed us to the spot. There was a leopard on the branch of the tree about 250mts from the road. One could barely see more than a yellow texture with black spots with naked eyes, but these naturalists are amazing to spot these while in the jeep. We clicked a few ‘documentary shots’, confirming it to be a leopard. As the tourists gathered, their noise made the leopard uncomfortable and he jumped off the tree into the thick bushes. It left what looked like a kill, and we too left the spot soon. That was my first spotting of a leopard in the wild, and was like a spec at that distance. 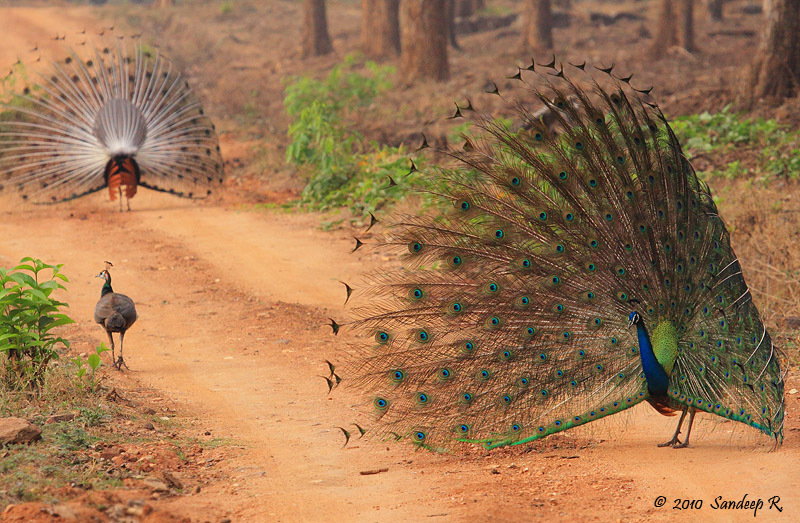 I was disappointed, and bored as we drove inside the Nagarhole forest. Few moments later, we spotted a pack of Wild dogs (Indian Dholes), strolling along the jeep track. There were 8 of them, and were playing with each other. Got some nice shots as the lay around leisurely. Warning calls from jungle fowls were readily heard. When we got enough of them we drove to other parts spotting few chitals and sambhars. Drove around the park for an hour clicking shots of few birds. Sighted and photographed a Small Green billed Malkoha. Then, returned along the same path of wild dogs sighting. I had shot full 8GB of my card by this time, and replaced it with a 2GB card. 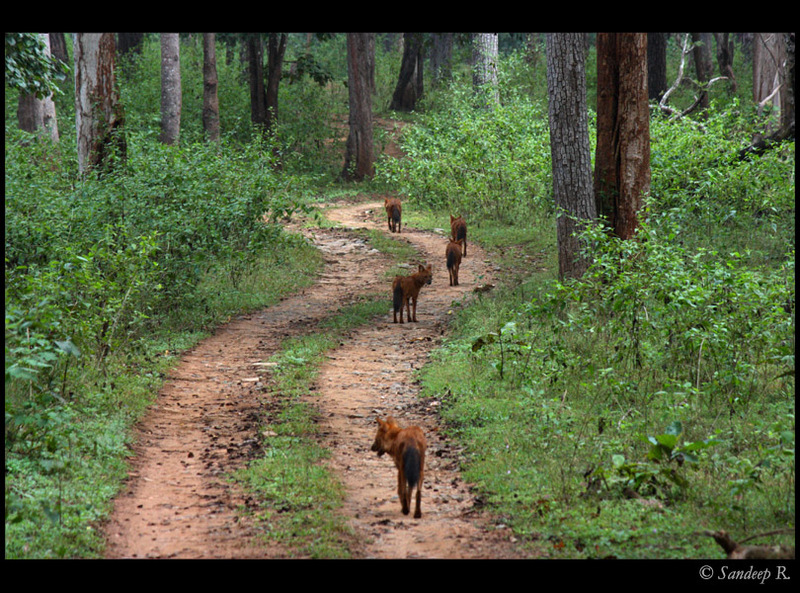 Were hoping that the Indian Dholes, which hunt in packs, would have made a kill, but no such luck. It was time to leave, back to the resort. I was about to suggest Prem that we visit the place we spotted the leopard again, he echoed my thoughts ‘Sir we’ll go to the place we spotted the leopard again and then leave.’ Reached that place and looked around. There was nothing i could see, but Prem spotted the leopard on a tree branch. He helped us spot it and capture. 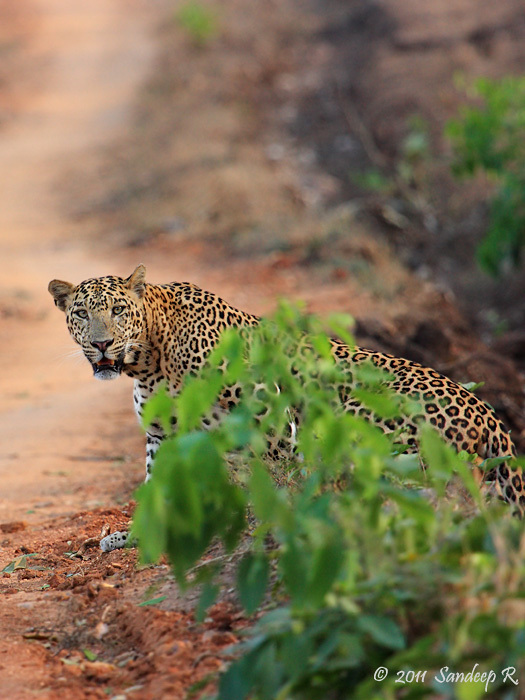 Leopard was at a distance, shot few frames hand held, then mounted our cameras on tripods and clicked few shots. The shots were dismal. We realized we need at least 600mm to get a decent shot of the leopard. Prem radioed to others of spotting this leopard. Others arrived soon, including those who had missed the leopard earlier. It was barely visible with naked eye, as earlier. We shot few snaps and showed them to other tourists. My 2GB card got over, and i picked another 2GB card to replace. As i changed, and was about to position myself to shoot, the leopard sprang and got down quickly. I missed the shots, but Sam got a few ‘better’ shots. Alas! May be next time. Returned to the resort for brunch, took a boat ride on the backwaters for 15-20min. Then back to the room, packed our stuff and checkout by 11:45am. From there we left for Mysore, we wanted to shoot the palace in the evening sun. Lunch at Royal Orchid at KRS by 3pm, relaxed for sometime. Started walking to the car the sky opened up, pouring heavily. Trees didn’t cover us much. This delayed us, and since it was still drizzling we abandoned the plan of shooting the cathedral and headed straight to Palace. More pics of wildlife and Mysore palace to come. Watch out my flickr space.